The summer holidays are upon us, and with around six weeks until the next day of school, you and your family may find more time to squeeze in some swimming sessions! So, to help you make the most of your family swimming sessions, we’re sharing five top tips on how best to support your child’s progress in the pool! Swim smart, and stay safe! When you and your family are around water, use this opportunity to teach your children about how they can enjoy the water safely. Try to explain in an age-appropriate way what could happen if they got into trouble in the water. Encourage them to learn the code to safety (see below). And always keep an eye on your children when they’re around water – even if they can swim, and even if there is a lifeguard on duty. Focus on fun and be creative! 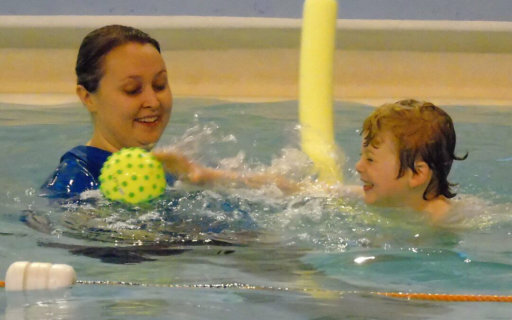 Swim sessions should be fun for all the family! So, try not to get too hung up on teaching your children how to perfect the execution of a particular skill in the water! Keep in mind that children learn best through play! So a fun session should not be seen as a lost opportunity to learn. Your children will be learning more than you realise! For younger children, use water toys, games and sing songs to keep them engaged and motivated to move through the water. There’s plenty that they will gain from a bit of creativity on your part! In Core Aquatics swimming lessons, the children have visited the zoo, the supermarket and swum with mermaids and fishes – all without leaving the swimming pool! Keep it fun and they’ll keep learning! Water toys and games are often still popular amongst older children, and so too are races and competitions! So, appeal to your child’s competitive side to help them build strength and practise their strokes. And, set them exciting challenges to help boost their swim skills (e.g. collecting as many sinkers as they can from the bottom of the pool). Every swimmer progresses at their own pace. So, with this in mind, try not to be too pushy when taking your child swimming! Confidence in the water can take a big knock if a swimmer is pushed into something when they’re not ready for it (e.g. putting their face in the water). Because of this, try to be patient and wait for them to have a go at performing that skill of their own accord when they feel ready. Of course, by all means, encourage your child and demonstrate how it can be done safely in the meantime! Of course, safety should be a priority when practicing swimming, so work on gradually reducing the amount of support you provide, and stay close enough to jump in and offer some assistance if/when it is needed! If there’s one thing I’ve learn from almost ten years of teaching swimming, it’s that children seek reassurance and respond to praise – especially that of their parents and guardians! So, always try to maintain a positive attitude and praise your children! If you do want to give a bit of feedback, try to sandwich your corrections with compliments and praise. Criticism can be frustrating and demotivating when learning how to swim, so always try to emphasise the things they’re doing well, rather than concentrating on what they need to improve. We hope you’ve enjoyed these top tips and that you’ll be able to make use of them this summer! For more information and advice on swimming-related topics, have a read of our other blog posts. And, to learn more about what we do, follow us on Facebook and Twitter @CoreAquatics. If you’re interested in booking swimming lessons for yourself or your child, contact us today by calling 07505065184, or send us an email at nicole@77.104.129.183.